46 - $69.99 Only 2 left! The fashion industry offers us a ton of nuanced and amazingly different styles of clothing to wear depending on the event that we’re getting ready for. The problem is that much of the wealth of attention to crafting outfits that can blend the work day with the night life has been granted to our refined lady half of the population. That is great! However, it does leave a lot of guys rushing home after the day at the office to change from the business suit and tie and into more festive clothing for the after hours celebrations. And, even then, it’s usually just a slightly flashier shirt with the same old suit coat. So, what is a guy to do when he wants to make that stylish mark at the office and also shift easily into a relaxed celebration afterwards? Well, we can see exactly what you are thinking! You want to be a star of office and entertainment and you know what they say: dress for the job you want! So, what better route to go than showing the world that you live amongst the stars even while your feet are planted firmly on the ground? How is anyone going to manage that, though!? 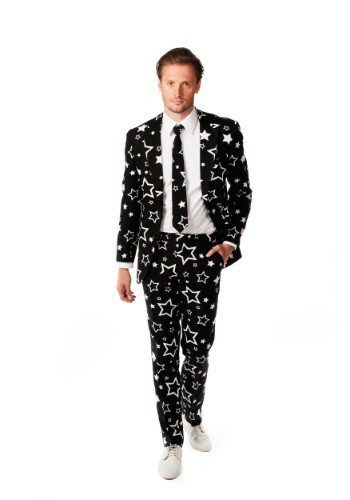 Well, the Men’s OppoSuits Starry Suit is the perfect answer for the man looking for a way to keep it classy while still showing off their unique personality. The fully lined suit jacket is made of comfortable polyester and features two front button closures all with bright star patterns over dark black fabric. 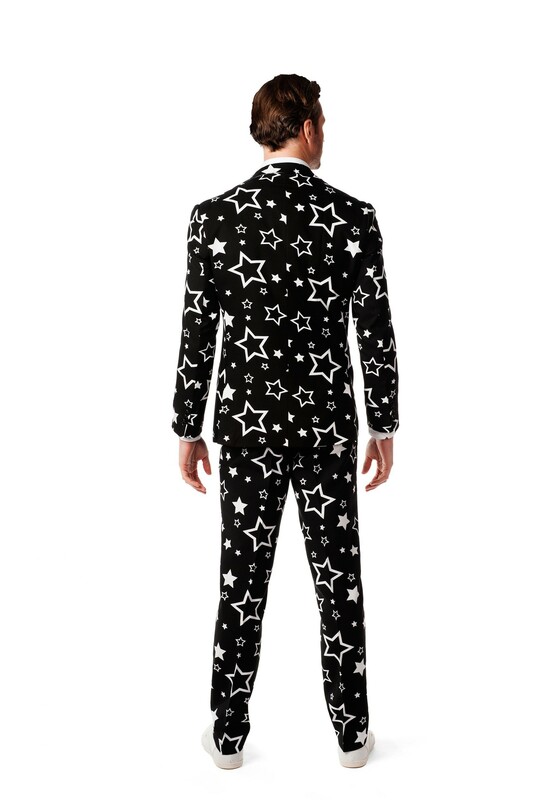 The matching tie and pants show that you’re fully committed to living among the stars. Note that some tailoring may be ideal for a perfect fit, but that will only make your look even better! Don’t miss a minute as you bring the excitement of night into your day and smile bright as you conclude the year right with a look that can’t be replicated.